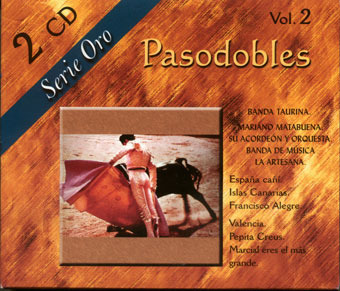 The pasodoble forms a part of the digest of the Spanish music band and is in the habit of consisting of introduction and two principal parts, with a rhythm "aflamencado". The bullfighter pasodoble is simultaneously, happy and melancholic. It sings for the sadness of the death, or for a passionate happiness. The bullfighter pasodoble must assemble three indispensables conditions. It has to be popular, a modality "aflamencada"
With a certain brave melody. It has to have a special garb that takes inside the whole spirit of our festive mentality.